Happy Feast of the Annunciation. And by (no) coincidence, happy day that the Supreme Court hears arguments from Hobby Lobby and Conestoga Wood--arguments that will decide whether business owners (and, nay, every American) still have a smidgeon of religious liberty left. Remember the punched-in-the-gut feeling on the day the Supreme Court didn't rule Obamacare as unconstitutional? I do. I feel like I'm in for round two, though I pray for the opposite. Do business owners have religious freedom? Can ‘free citizens’ be forced to pay for child-killing drugs? On Tuesday, March 25, the United States Supreme Court will hear arguments in two cases (Hobby Lobby and Conestoga Wood) that could dramatically alter the future of religious liberty in America. 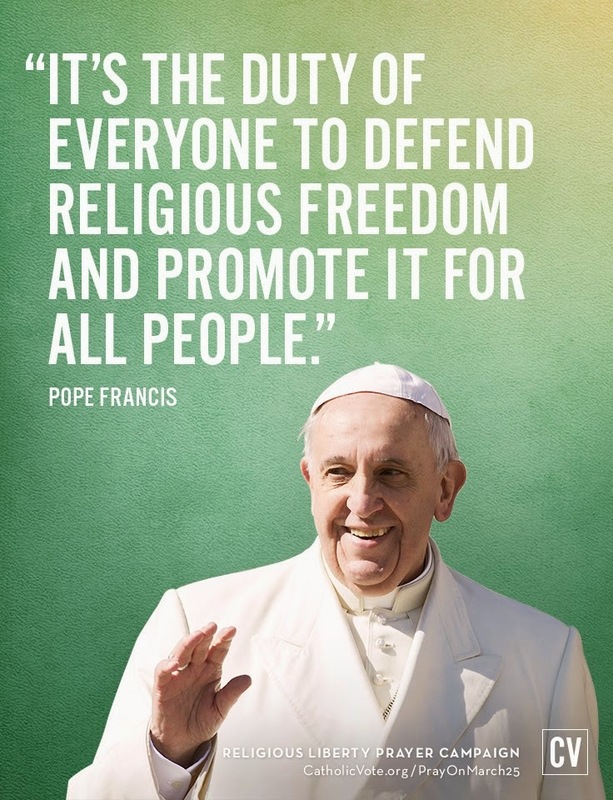 That’s why we have launched our National Prayer Campaign for Religious Liberty. 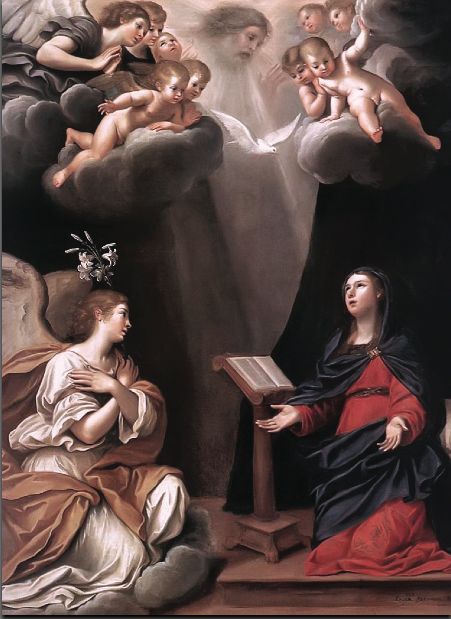 The court is set to hear arguments in these critical cases on March 25th – the Feast of the Annunciation. The day when the Blessed Virgin was told by the Angel Gabriel that she would give birth in 9 months to the Savior of the World. Religious liberty is at the heart of these court cases. And while the Supreme Court has incredible power, the power of prayer is unmatched. That’s why we are asking every CV member to commit to praying to Our Lady of the Annunciation. We printed out tens of thousands of prayer cards and sent them to parishes and schools and to CV members nationwide. 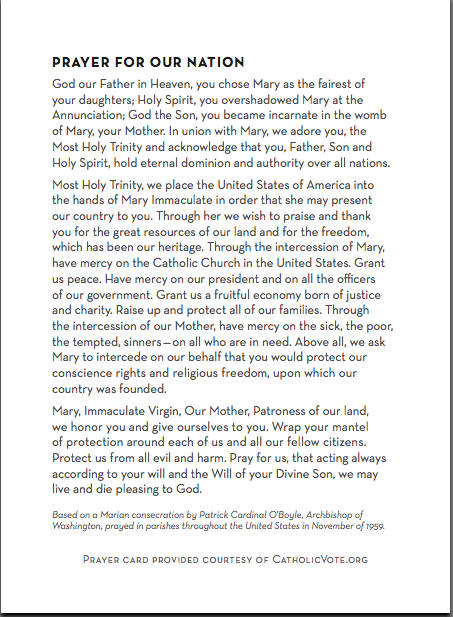 This prayer reflection is based on a Marian consecration by Patrick Cardinal O’Boyle, former Archbishop of Washington — and it was prayed in parishes throughout the United States in November of 1959. Religious liberty has allowed the Church to flourish in this land for two centuries. At this hour, when the right to practice our faith is on the line, let it be known that we Catholics not only stood our ground – but that we also fell to our knees in prayer. And second, action: Print and say this prayer for our nation tonight with your family.